This case study summarizes the events leading up to and following the filing of a lawsuit by a woman against her employer for an injury allegedly suffered as a consequence of a toxic exposure to a cleaning chemical. It illustrates the important role a toxicological assessment can play in litigation and demonstrates how inference and assumption can be discredited by objective toxicological analysis. A housekeeping employee at a hospital in California reported using a combination of industrial-grade, janitorial cleaning products to clean a sink. She immediately experienced coughing, watery eyes and a burning sensation in her nose and chest upon inhalation of the fumes. She began to feel very tired and weak but continued to work. Over the next several days, her symptoms progressively worsened. Approximately two weeks after her exposure to the cleaning chemicals, she presented at the hospital with shortness of breath and a temperature of 100.4 degrees. An X-ray of the chest noted ground-glass abnormality in the lower lung zones, focal infiltrate at the right lung base and areas of possible air trapping. She was not able to return to work due to continuing respiratory issues and complications. Ultimately, she was diagnosed with an interstitial pulmonary injury and end-stage fibrotic lung. Her condition subsequently required lung resection and transplant. After her recovery, a lawsuit was brought by the employee against the hospital. Past medical records revealed that the plaintiff had a history of asthma, pneumonia, bronchitis and chronic obstructive pulmonary disease (COPD) for six years prior to this exposure. Although these diagnoses indicate that the plaintiff may have been predisposed with compromised pulmonary function prior to her exposure, they do not provide an explanation for acute injury and rapid end-stage fibrotic lung. A Material Safety Data Sheet for the janitorial cleaning product named in the claim reveals that it contains 1-3% phosphoric acid when properly diluted. 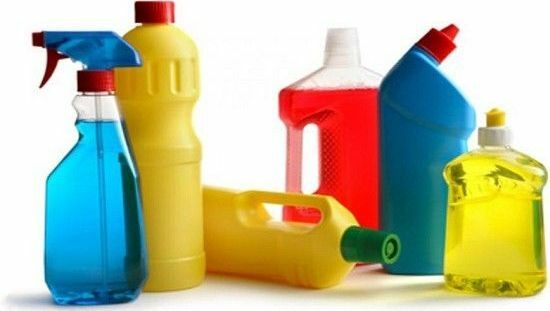 Phosphoric acid is ubiquitous in cleaning and personal hygiene products. NIOSH estimates that each year 1.2 million workers are potentially exposed to phosphoric acid. While it is generally recognized that phosphoric acid is an irritant to the skin, eyes, mucous membranes and respiratory tract, workers rapidly become acclimatized.1,2 It is generally accepted in toxicology that the risk of pulmonary edema resulting from the inhalation of the mist or diluted spray is remote. In fact, a review of all available human epidemiological studies is negative for any such findings. Furthermore, the Hazardous Materials Identification System reveals that the cleaning product at 1 to 3% dilution is no more hazardous than common window cleaner. Spray bottles of the cleaning product were tested with respect to particle size. On average, the particle size of each droplet was generally greater than 100 µm (non-respirable) with less than 0.03% of respirable size. In other words, the spray bottles of the product did not produce respirable particles capable of reaching the mid or deep lung regions but rather would be trapped within the upper respiratory tract by the nose, trachea, larynx or mouth. Thus, less than one-half percent of the droplets would have been capable of penetrating into the deep lungs causing injury. Additionally, highly soluble acids, such as phosphoric acid, are absorbed into the moist regions of the mouth, nose and pharynx. With no human epidemiological evidence supporting a causal relationship of inhaled phosphoric acid aerosol with deep lung injuries and a review of phosphoric acid toxicity, Dr. Sawyer was able to demonstrate that the plaintiff's exposure to the cleaning product did not contribute to her lung injury and ultimate transplantation. It should be noted, however, that the plaintiff was co-exposed to chlorine gas from her contraindicated mixing of cleaning products and this most likely caused her permanent injury. Causal relationships are sometimes presented in court as bona fide without supportive toxicological evidence. In such cases, the outcome can rest more on the veracity and credibility of personal testimony than on unbiased, objective findings. TCAS has experience assessing the circumstances surrounding chemical injuries. We routinely create comprehensive reports, offer expert opinions and provide expert witness consults, any or all of which can make a significant difference in a case. TCAS strongly recommends that any individual, company or government agency engaged in litigation matters concerning exposure to cleaning chemicals always retain the services of an experienced expert toxicologist. U.S. EPA, "Health Effects and Aerometrics," Environmental Criteria and Assessment Office, EPA/600/8-88/005F, 1989. U.S. EPA, "Documentation of the reference concentration for chronic inhalation exposure (RfC) for phosphoric acid," Washington, DC, 1995. "Causation can be demonstrated or refuted, but the evidence must be scientifically sound and compelling. An impartial toxicological assessment can often reveal facts which have the potential to significantly impact the outcome of a case."